Lionsgate has finally made their Hunger Games theme park plans official today. The Lionsgate zone will feature state-of-the-art theme park attractions and a retail facility inspired by Lionsgate's global blockbusterThe Hunger Games franchise. "Our franchises are continuing to drive location-based entertainment opportunities around the world," said Lionsgate Chief Executive Officer Jon Feltheimer. "We're proud to partner with the team at Dubai Parks and Resorts to create a thrilling total entertainment experience designed to attract millions of new fans and continue the global expansion of our brands." Dubai Parks and Resorts Chief Executive Officer Raed Al Nuaimi said, "We are thrilled to be working with a Hollywood studio whose creative resources, spirit of innovation and vision of the entertainment experience are so closely aligned with our own. Lionsgate'sHunger Games, Step Up and other signature properties are the perfect centerpiece for one of the most visionary new theme parks in the world. 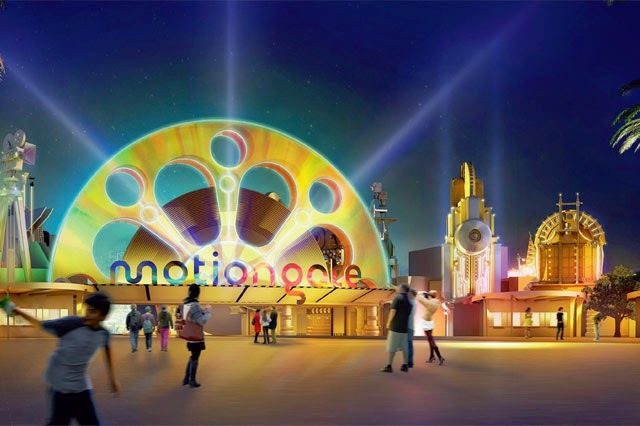 Through this partnership we are offering even more for the whole family to enjoy on their visit and are confident that motiongate™ Dubai will set a global benchmark as the ultimate movie themed destination." "motiongate™ Dubai is poised to become one of the most exciting new entertainment destinations in the world, and we're thrilled that many of our biggest franchises will be an integral part of it," said Lionsgate Executive Vice President of Global Franchise Management and Strategic Partnerships Kerry Phelan and Senior Vice President of Branded Attractions Jenefer Brown. "The Lionsgate section of motiongate™ Dubai is an important milestone in our ongoing commitment to extend the longevity, broaden the global fan base and enrich the vitality of our most exciting entertainment properties."